Exacerbations are a recurrent feature of bronchiectasis and have substantial detrimental impacts on symptoms, quality of life, treatment cost and decline in lung function. Exacerbation is suggested by increase in frequency of cough, change in cough character, fever and increase in sputum volume and purulence. Dyspnoea and exertional limitation may be a feature, along with malaise, lethargy and anorexia. Although many patients have worsening chest auscultatory findings during exacerbation, spirometry is not usually acutely depressed. Sputum culture should be performed before antibiotic therapy is started; empirical treatment should be commenced rather than waiting for the result. Treatment should be directed at the last known isolate while recalling the efficacy of the last treatment provided. If no previous microbiological guidance is available, an empirical approach is warranted (Table 4). Antibiotic selection can be challenging when multiple pathogens are present, although quantitative assessment of a culture can be directive. 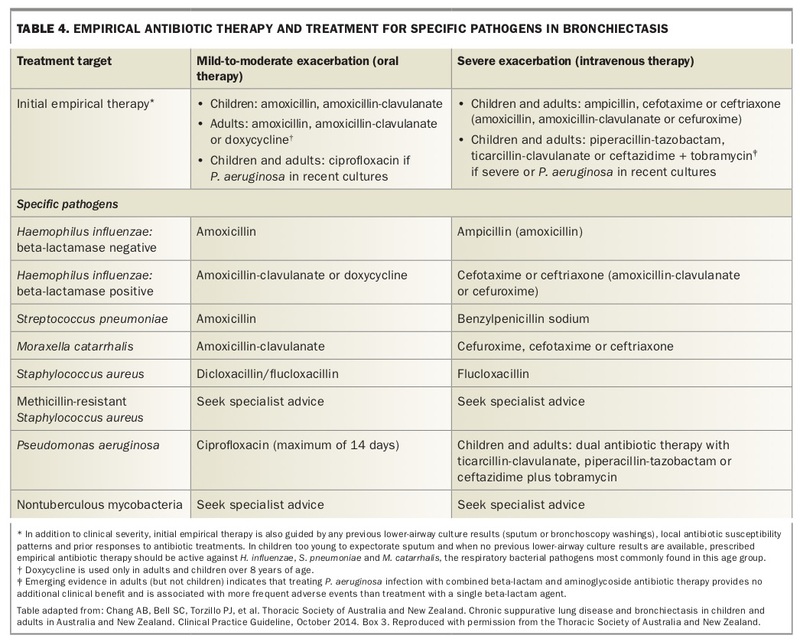 New pathogens generally require treatment although a period of observation may be warranted if no clinical sequelae accompany a novel acquisition. Treatment needs to be commenced promptly at the onset of an exacerbation; educating patients about recognising an exacerbation and providing a prescription to enable self-initiation of treatment can facilitate this. Although exacerbations of lower respiratory tract infections are common, so too are infections such as atypical pneumonia. Minimal chest x-ray evidence may be found in atypical pneumonia, and symptoms such as headache, myalgia, scant sputum production and deranged liver function test results should prompt consideration of macrolide therapy for mycoplasma or chlamydia infection. Similarly, common comorbidities such as sinusitis, rhinitis, asthma and gastro-oesophageal reflux disease may exacerbate symptoms and may need independent treatment at the time of exacerbation. Referral for intravenous therapy and inpatient treatment may be needed if there is high fever, significant constitutional symptoms such as malaise, anorexia and weight loss, dehydration, difficulty with sputum clearance or decline in lung function. A limited capacity to initiate, continue or escalate a program of mucoactive therapy and airway clearance also indicates that referral is appropriate. Inhaled antibiotics offer an exciting treatment opportunity in non-CF bronchiectasis for the suppression of bacterial colonisation, treatment of acute exacerbation and potentially in the eradication of colonist pathogens. There has been much recent trial activity exploring the use of antibiotics including ciprofloxacin, tobramycin, colistimethate sodium, aztreonam, amikacin and ceftazidime, and although the results are not universally positive they suggest some capacity to reduce bacterial burden, reduce exacerbation frequency and facilitate pathogen eradication.31 Inhaled antibiotics can achieve high concentrations at the site of infection while minimising systemic side effects and showing good patient tolerability characteristics. To date there is little evidence to suggest the emergence of treatment-resistant pathogens with their use.32 Vibrating mesh technologies in newer nebulisers are faster than conventional jet or ultrasonic nebulisers and provide shorter treatment times and more efficient pulmonary deposition of drug particles. Dr Rangamuwa is an Advanced Trainee in Respiratory Medicine and a Respiratory Registrar at The Alfred Hospital, Melbourne. Associate Professor Stirling is a Senior Specialist in Respiratory Medicine at The Alfred Hospital, Melbourne; and a Clinical Adjunct Associate Professor in the Department of Medicine, Monash University, Melbourne, Vic. Triple therapy for COPD: who needs it?